Most discussions on Cuban affairs reveal deep seated discords along ideological lines. However, when the conversation centers around educational attainment issues, the tendency is to praise the levels of educational excellence achieved by Cuban students in schools throughout the island. The main criticisms since the Castro government nationalized all schools are usually about the government’s intent to achieve excellence through education policy, the rigidity of the curriculum, and the intrusive state controls over all aspects of education by Ministry of Education officials. Few studies, if any, have carefully examined educational progress after the revolution as measured by graduation rates among Cuban students. To be sure, there are many Cuban education accomplishments to celebrate. For instance Cuba continues to outpace many of its neighbors in educational investment1 and Cuban immigrants (even those who migrated to the United States recently) enjoy much higher levels of educational attainment than other Hispanics in the United States.2 A recent report by the Cuban National Statistical Office (ONE), La Educación en la Revolución 1958–2008, offers a unique opportunity to reconsider levels of educational achievements in Cuba by longitudinally examining a considerable amount of educational data from all grades. The report should be praised for its comprehensiveness and wide range of data. 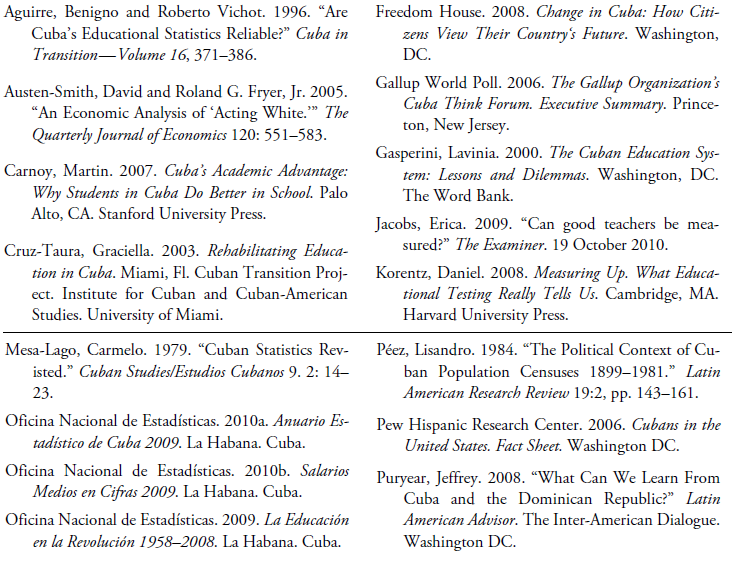 The purpose of this paper is to assess the state of education in Cuba today by using graduation rates instead of the less reliable enrollment figures and educational attainment levels.3 Such analysis shows mixed results as both positive and negative aspects of the Cuban education system come to light. For example, there are ample opportunities for non-traditional students and working adults to obtain professional training, to re-train, and to complete unfinished degrees. Additionally, access to education continues to be free and universal and pre-kindergarten schools have been established all over the island. Literacy rates, measured by elementary and middle school enrollment and completion rates, are among the highest in the world.4 Also the gender gap has been effectively eliminated and in some instances, female students have outpaced their male counterparts (ONE 2009, p. 170).5 However the report also shows that Cuban educators face some of the same challenges that their fellow educational professionals confront elsewhere in the world, including OECD nations. Furthermore, one of the main goals of the revolution—to eliminate the gap between urban and rural areas—continues to be present despite the amount of resources allocated to support this effort. More significantly, there has been a decline in graduation rates after high school and there is a need to motivate traditional students to attend universities and post-graduate programs, especially in non-professional and less vocational fields. How one accounts for Cuba’s education problems is open to further interpretation and discussion; however, I assert that the social isolation and palpable discontent among the youth is one reason that accounts for the current condition of education on the island. Any discussion of educational attainment is always highly controversial, politicized and contentious whether it relates to Cuba or elsewhere.6 At the center of this discussion are questions of how to effectively measure educational success and how to explain the root causes of student achievement. Educational scholars who support standardized testing, accountability, and pay-for-performance policies usually measure success through results of national standardized tests such as the National Assessment of Educational Progress (NAEP) periodically conducted by the National Center for Educational Statistics (NCES) in the United States. However, in a pathbreaking study about the dependability of testing, Professor Daniel Koretz (2008) of Harvard’s Department of Education documented the many risks and shortcomings associated with the internal validity and even the reliability of outcomes from standardized testing. One obvious and yet often neglected conclusion reached by Koretz and others is that, “while we can easily test to find out whether a student has learned some types of knowledge and certain particular skills, some other types of skills are far more difficult to test” (Koretz 2008, p. 37). Kortez’s argument also captures the essence of the debate between supporters of Cuba’s education, such as the educator and economist Martin Carnoy (2007), and his critics. Carnoy, a prolific social critic and Stanford professor, argues that Cuba enjoys greater academic success compared to any of its neighbors because Cuban students consistently outscore their peers in math, reading, and science assessments. The United Nations Education Scientific and Cultural Organization (UNESCO) conducted one of these tests in 1997 and Carnoy and others have used data from the report to back their conclusions. Yet, several of his critics point to the fact that the aforementioned test measured student performance in such basic skills as reading and math and although these are essential academic subjects, they are poor predictors of critical thinking skills and other more comprehensive academic requirements in the social sciences and humanities.7 Thus, these critics conclude that Cuban students might perform consistently well in the more technical subjects, but comparable levels of achievement are not evident in other more interpretative, but not less rigorous, academic fields. It is important to note that whether or not interpretation and comprehension can be tested through standardized tests is still open to much debate and speculation. Any cross-national comparisons present an even more challenging dilemma for educators and educational scholars alike: can we find comprehensive assessment tools to reliably compare scores across nations? Using the same dataset as Carnoy, Jeffrey Puryear (2008), a Vice President for Social Policy at the Inter- American Dialogue, makes another critical point. Puryear compares scores from the Dominican Republic and Cuba to make two points: that the almost identical reverse trends in these two neighboring island nations is indicative of the social inequities that continue to plague Latin America and that the Cuban model should serve as an example to emulate in the rest of the continent. Although valid, this conclusion underestimates the disparity rates of human capital development that have afflicted both nations since the postwar period, well before the Cuban revolutionary government instituted its educational policies, and when Cuba already enjoyed much higher educational attainment levels than other Caribbean, and many Latin American nations. Again, the Puryear study points to a very significant methodological problem: to what extent is it methodologically sound to compare cases with questionable comparability? The record of Cuban education is outstanding. …the Cuban case demonstrates that high quality education is not simply a function of national income but of how that income is mobilized. A highly- mobilized people can realize high quality education by ensuring the necessary inputs, paying attention to equity, setting and holding staff to high professional standards, and caring for the social roles of key stakeholders … (Gasperini 2000, pp. 10–11). Education in Cuba has always been a vehicle to achieve social mobility and status attainment. It is also one of the few enduring institutions in the country that can diffuse nationalist values and ideals. The University of Havana, the oldest national university, was founded in 1728 and by 1792 the Real Sociedad Patriótica de La Habana began to promote public education throughout the island. The Sociedad Económica de Amigos del País, perhaps the most institutionalized and well known among the cultural societies, was also founded in the late 18th century. Public intellectuals always played a key role in promoting independence efforts and alternative nationbuilding policy schemes. Students have played the role of active protagonists in all political quarrels in Cuba’s history. Another feature of Cuban education is how much it has embraced transatlantic linkages and its close ideological affinities to intellectual movements and ideas from abroad. Considering this historical legacy, it is not surprising that before 1959, Cuba already topped the list of countries enjoying a high literacy rate in the Western hemisphere and that two years later, the Literacy Campaign of 1961 mobilized young volunteers throughout the country to teach 707,212 adults. At that point, many of the adults who did not know how to read and write resided primarily in rural areas. The literacy campaign therefore was as much of an effort to bridge the urban-rural educational gap that existed as an effort to consolidate more popular support for the radicalism of the new revolutionary government in a period of diplomatic and domestic turmoil. Also, in 1961, pre-schooling became available as part of new educational reforms. The relation between the state and schools was defined in this early period of consolidation too and has shaped the major parameters of Cuba’s education since then. Hence, the principles governing the educational system are characterized by four basic core tenets: (1) universality; (2) inclusiveness; (3) commitment to promote revolutionary values as defined by the state; and more importantly, (4) efforts, not always successful, to improve educational attainment and social wellbeing through improving graduation rates. A shortage of qualified teachers and high drop-out rates affected the quality of schooling during the 1960s and early 1970s. Between 1964 and 1970 in particular, schools were the vehicles to promote the conception of a new revolutionary citizen proposed by the state. These shortcomings also prompted several new reform initiatives that paralleled the political institutionalization process leading to the adoption of the Constitution of 1976. The First Cuban Communist Party Congress solidified the role schools should play in the building of a socialist society in Cuba under the watchful eyes of the Ministry of Education and close community ties. It is important to emphasize that since the 1960s, revolutionary officials have perceived the improvement of graduation rates as a key component in the socio-economic development of the revolution. Accordingly, the state has made an investment in education not just because it is another manifestation of its social concerns, but more importantly to support the goals of the revolution. For government officials, this characterization legitimizes the tight control they exercise over educational policy and schooling in general. Following the Marxist-Leninist orientation towards the state, it is this institution, as the embodiment of the proletariat, that is best suited to defend the interests of that class. In the particular case of Cuba, the state views itself as the promoter of two revolutionary class interests with regards to education: (1) to maintain social order; and (2) to place education at the service of national development goals as they are operationalized by the state. It is important to consider this rationale because it explains the universal and intrusive character of state officials and even perhaps the dispersion of graduation rates among academic fields. This mind set might also explain the character of the statistical reporting itself since the way the data is published seems to represent collective social goals instead of the competitive nature among groups of students and institutions which would require more disaggregated data. If my interpretation of the norms and goals of Cuba’s educational policy is correct, the outcome of educational reforms, as measured by the data published in the recent educational compendium by the ONE, shows mixed results. A careful analysis of this data demonstrates that it is precisely those key tenets of educational attainment that have concerned Cuban officials most where the outcomes have come up short of the expected targets. Thus, education in the island continues to be plagued by two manifestations of inequality. One is the discrepancy in graduation rates between the city and the interior of the country and another is the incremental rate of attrition in the more advanced grades. In addition, the data show enough evidence in support of Garperini’s concern regarding the high degree of vulnerability of education to the adverse effects of economic cycles. The total number of university graduates, for instance, peaked in the school year 1990/91, when it reached 39,374 graduates. In 1997/98 the number of graduates decreased to 1983/84 levels, and did not rebound until 2006/07 when according to the ONE, the number of university graduates reached 44,738 (ONE 2009, Table no. 29, p. 122). There are two possible set of reasons that might account for the popularity of these two professions among college students. One is that the Cuban government might be incentivizing students to go into these two fields to support its profitable international medical and educational humanitarian missions abroad that also are an integral component of Cuba’s soft diplomacy. Another possibility is that qualified students know that the likelihood of traveling abroad to work is greater with degrees in these two fields, and therefore they purposefully major in either of them. One of the major goals of educational policy since 1961 was to narrow or eliminate the disparities between cities, which disproportionally benefited from accessibility to education during the Republican period before 1959, and rural areas. Table 1 shows the dispersion of graduates between urban and rural districts from 1961 through 2008. The proportion of graduates in primary schools from urban and rural districts is a valid comparison; it is the most representative of all educational figures in Cuba since primary education is mandatory in the island and attendance policies are well enforced nationwide for all children. The mandatory attendance policy is one of the reasons for the high graduation and literacy rates among primary schools. As Table 1 shows, there is a wide discrepancy between urban and rural graduation rates of children enrolled in elementary education in Cuba. Moreover, between 1960/61 and 2007/08, the gap remains almost unchanged, narrowing only by one percentage point. In all fairness, it is difficult to determine what constitutes a rural or an urban school district based on the published reports by ONE since the agency does not operationalize these two categories or provide data for all cities, with the exception of the capital. The discrepancy is sufficiently wide, however, to be concerning for any educator interested in the repercussions of this issue. To examine this trend further, the proportion of children who finished elementary school in Havana as a percentage of the overall population of children between ages 5 and 9 in that city are compared to similar measures from the province of Isla de la Juventud. While almost 100% of Havana’s children between the ages of 5 and 9 graduated from primary schools in the school year 2007/08, only half of children did so in Isla de la Juventud. Unfortunately, it is impossible to account for differences in characteristics, such as family composition, parental mentoring and guidance, general quality of schools, or pedagogical effectiveness, to account for the variability of graduation rates because the data has not been published. The figure that corroborates the discrepancy in graduation rates between urban and rural areas is the concentration of graduates by grade level in the capital city of Havana schools. Table 2 shows that Havana has one of the highest levels of human capital indexes in the country. Roughly speaking about one in five students nationwide who enter and finish school, graduate from the city’s schools. This trend has been sustained with some variation since 1990. Another measurement of human capital formation is the retention rates in schools. To calculate this measure it is best to examine older students who attend schools beyond elementary grades, as it is mandatory by law to attend schools in Cuba through at least high school. From the retention rates in selective districts shown in Table 3, it is fair to assert that Cuban schools have low dropout levels. Such low dropout levels contribute to the generally high levels of human capital index. Nonetheless, there is evidence of a distinct pattern of retention nationwide. In cities like Havana and Santiago, the retention rates among students in the preuniversitario, or the senior high level, was higher than among the technical school population between 2004/08. In the interior of the country, the trend is reversed. This paradoxical conclusion seems to be one of the effects of the differences in graduation rates discussed earlier. It is possible that since the quality of education is lower away from the urban districts, students are more inclined, or simply encouraged, to find more vocation career training in technical and professional schools. The best students, those who demonstrate higher academic potential, may simply be encouraged to migrate to the cities and join their urban peers in attending the most reputable universities. Again, it is difficult to empirically support this assertion with the available data; however, enrollment levels at the University of Havana and its affiliated institutes are much higher than universities from other parts of the country. The final analysis of the composition of the human capital index in Cuba refers to a comparison of the most popular academic fields among university graduates between 2005 and 2008. This comparison shows a growing preference among graduates for more marketable and service-oriented professions such as medicine, education and sports and the declining popularity of the humanities and so-called hard sciences such as math and the natural sciences. According to figures from the 2002 Cuban Population Census published by ONE in 2010, the services sector employed the largest number of people in the island and in 2008 accounted for 42% of those employed. The number of workers employed in scientific and technical related activities however showed a decline after peaking in 2005.11 The preference for employable careers among Cuban university students is similar to those from other countries. For instance, the United States has also witnessed a noticeable decline in university enrollment and graduations rates in the humanities and other related fields. However, in Cuba, this trend might also have political connotations of its own. Despite the weighted effects any particular labor market’s incentive forces might have on fluctuations in educational attainment, students of educational and professionals policies have also examined the effects of social isolation and discontent to account for the vocational inclination and relative oxidation of educational gains among groups of graduates. In a 2005 paper, Austen-Smith and Fryer demonstrate that the achievement gap between white and black students in the United States is not so much a function of the effects of dysfunctional peer and community pressures as it is the result of rational decision making on the part of alienated groups of individuals who feel deprived of the economic and social opportunities they confront (Austen-Smith and Fryer 2005). Following this important insight from Austen-Smith and Fryer, I propose that one of the reasons behind the recent distortions in educational attainment concentrations shown by students after secondary school, as measured by the retention rate and the student’s career choices, is their discontent and lack of identification with the daily situation the youth has to confront in Cuba today. To support this hypothesis I refer back to key indicators of quality of life in Cuba reported among the findings of the 2006 Gallup Poll and other surveys. When asked about their general satisfaction with their freedom to conduct their daily lives, only 1 in 4 respondents, or 25%, expressed satisfaction, a figure dramatically lower than the rest of Latin America. Only 42% reported that people in the island get ahead by working hard. About 68% said they were satisfied with their jobs and more than half, 60%, said their jobs give them an opportunity to do what they do best every day, both figures were significantly lower than for the rest of Latin America, a sign of worker’s alienation. When asked if they approve of their political leadership, less than half, or 49% said they did, as opposed to 51% who disapproved or did not respond to the question. And in a report from multiple survey sources published by Freedom House in 2008, the overwhelming majority responded skeptically when asked about the impact of recent reforms instituted by Raúl Castro’s government (Freedom House, 2008, p. 10). This paper has examined the levels of human capital index in Cuba as measured by various graduation rates. I argue that despite the general tendency by international organizations and some scholars to measure human capital according to educational enrollment levels or student achievement through standardized testing, graduation rates offer a more reliable account of the educational spectrum. The more obvious reasons behind this assertion is that not all students who enroll in schools eventually graduate, few repeat grades, and, despite its shortcomings, graduation rates measure the overall ability of students more comprehensively than do standardized tests. Once graduation levels are discerned, enduring inequities among human development indicators appear. These results are not always popular with governments, especially among states like Cuba that manipulate educational opportunities as a legitimacy claim. Objectively, graduation rates more often than not uncover mixed results. In the case of Cuba, it is obvious that their commanding approach to enforcing mandatory school attendance through junior high school, the lack of educational private alternatives, and to some degree, the levels of social mobilization, have impacted the unusually high levels of literacy rates that give some credence to government policies. However, once data other than the junior high level—when students have more of a choice about their educational future—is examined, weaknesses in the government position begin to surface as a result of the variability of different graduation rates. Lastly, the findings indicate that the trend towards more vocational and practical careers choices will continue, and may even be accelerated, after the government’s recent decision to trim the state labor force by half a million state employees take effect. 2. The Pew Research Center estimated that in 2006, 25% of all Cubans residing in the U.S. had earned a college degree as opposed to 12% of other Hispanics. See Pew Hispanic Research Center. Cubans in the United States. 2006 Fact Sheet.http://pewhispanic.org/files/ factsheets/23.pdf. 3. There have been several documented issues reported by Mesa-Lago (1979) and Pérez (1984), among others, about the validity and reliability of Cuba’s statistical reporting. Although this is an important discussion, it is not the goal of this paper. For a discussion of the reliability of Cuban education data see Aguirre and Vichot (1996). 4. Cuba’s literacy rate is comparable to that recorded by industrial nations and further ahead of practically every developing nation. 5. I am not sure if this trend should be considered an achievement of Cuban educators or if these numbers are part of a general demographic trend since in the United States a similar distribution has been noted. 6. Witness the discussion in the United States about assessment and affirmative action, for instance. 7. For example, one of those critics, Graciella Cruz-Taura (2003, p. 5), states that disparities in educational attainment levels in Cuba could be attributed to the political character of education and the role it serves to sustain the Cuban state. 8. See Gallup 2006 Executive Summary. 9. Since teachers are well trained to detect under what conditions students learn best, and since an assessment of this learning environment is usually perceived to be a reflection of the quality of teachers, it is possible to expect teachers not to abuse social promotions in order not to damage their reputations among their peers and risk the possibility of being reported to supervisors, causing strenuous consequences for their careers. For an interesting take on how teachers informally assess other teachers, see Erica Jacobs (2009). 11. See Tables 7.3 and 16.1 (ONE, 2010a).